Elephant seals are well named because adult males have large noses that resemble an elephant's trunk. Males begin developing this enlarged nose, or proboscis, at sexual maturity (about three to five years), and it is fully developed by seven to nine years. Adult males may grow to over 13 feet (4 m) in length and weigh up to 4,500 pounds (2,000 kg). The females are much smaller at 10 feet (3 m) in length and 1,500 pounds (600 kg). The northern elephant seal is the second largest seal in the world, after the southern elephant seal. The elephant seal is in the phocid, or true seal, family. It lacks external ear flaps and moves on land by flopping on its belly. The elephant seal has a broad, round face with very large eyes. Pups are born with a black coat which is molted, or shed, at about the time of weaning (28 days), revealing a sleek, silver-gray coat. Within a year, the coat will turn silvery brown. Northern elephant seals are found in the North Pacific, from Baja California, Mexico to the Gulf of Alaska and Aleutian Islands. During the breeding season, they live on beaches on offshore islands and a few remote spots on the mainland. The rest of the year, except for molting periods, elephant seals live well off shore (up to 5,000 miles, or 8,000 km), commonly descending to over 5,000 feet (1,524 m) below the ocean's surface. Each winter elephant seals arrive at their breeding beaches in Mexico and California. Males are the first to arrive, and they fight each other to establish dominance. During this time, dominant males will often inflate their noses and produce a noise that sounds like a drum to warn lesser males away. Females soon arrive and associate with dominant males. Several days after coming onto the beaches, the females give birth to the pups they have been carrying since last year. Pups weigh 75 pounds (35 kg) or more and are about four feet (1.25 m) in length. The pups nurse for about 28 days, generally gaining about 10 lbs (4.5 kg) a day. At this time females will mate with one or more of the dominant males and then return to sea. For the next two months, weaned pups, called "weaners," remain on rookery beaches, venturing into the water for short periods of time, perfecting their swimming and feeding abilities. Eventually, the pups will learn to feed on squid, fish, and occasionally small sharks. While living in the open ocean, northern elephant seals spend a lot of time diving, up to two hours at a time. They rarely spend more than four minutes at the surface of the water between dives. It is believed that they eat deep-water, bottom-dwelling marine animals such as ratfish, swell sharks, spiny dogfish, eels, rockfish, and squid. Elephant seals molt each year between April and August, shedding not only their hair but also the upper layer of their skin as well. This is known as catastrophic molt. They return to rookery beaches for a few weeks while molting. Females molt in the spring, juveniles in the early summer, and adult males molt in the late summer. The northern elephant seal is a conservation success story. After whales became scarce, elephant seals were hunted to the brink of extinction, primarily for their blubber, which was used for lamp oil. By 1910, it is estimated that there were less than 100 elephant seals, all found on Guadalupe Island off Baja California, Mexico. Today, the northern elephant seal population is approximately 150,000, with 124,000 of which in California waters, and is probably near the size it was before they were over-hunted. Northern elephant seals are the second most common patient at The Marine Mammal Center. 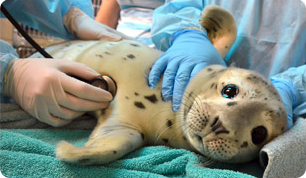 From mid-February through the end of June, the Center's rescue and rehabilitation work focuses on orphaned elephant seal and harbor seal pups. Usually these pups are washed away from the rookery during a storm or have not learned how to forage. As a result, the pups are often severely underweight. Weaned elephant seal pups should weigh 250 lbs (113 kg). Our patients are often admitted weighing less than 100 lbs. Elephant seals also suffer from other diseases such as northern elephant seal skin disease, pneumonia, and parasites, such as lungworm. Because most of our elephant seal patients suffer from malnutrition, many are successfully released (60-80%). This adorable Elephant Seal Plush Toy is soft and fuzzy, a perfect gift for children ages three and up. You can help our patients by Adopting Megan, an elephant seal pup found starving on a beach. This Elephant Seal Ornament is carved in wood from sustainably harvested trees. Makes a great decoration.